1922: Provisional Government set up by pro-Treaty TDs. Michael Collins is elected Leader of the government. 1965: The Taoiseach of Ireland (Sean Lemass) and the Prime Minister of Northern Ireland (Terence O’Neill) meet for the first time since the partition of Ireland in 1922. It was a truly historic meeting that began a thaw in relations between the two states. The meeting at Stormont Castle of two distrustful parties was so momentous and prone to disruption that it was not announced prior to the event. The meeting evoked generally positive reaction in the Republic but caused major problems for O’Neill. While moderate unionists supported talks on non-constitutional issues such as co-operation on tourism, the meeting did not sit well with Protestant fundamentalist like Rev. Ian Paisley who saw it as the start of a sell out. O’Neill paid a reciprocal visit to Dublin in February. 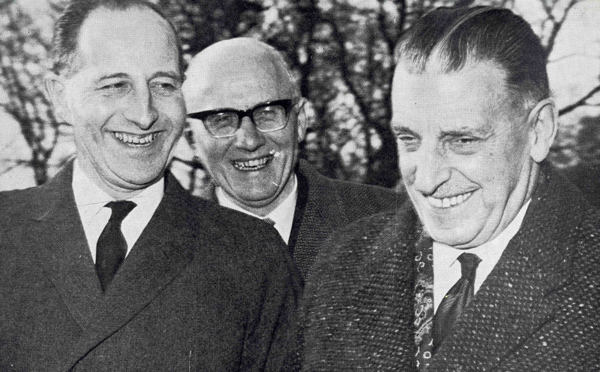 The smiles of Terence O'Neill and Sean Lemass hid years of distrust between North and South.